As I mentioned before, we're going to be releasing new products at a rapid pace throughout 2009. Our latest addition is a design that makes me extremely proud. Our philosophy at Carrington Court is one of offering quality at an affordable price. Quality is more than just the materials that make up a chair--it is also the craftsmanship of the men and women that build each one. Over the last couple of years we have sort of become specialists in nail-head trim. Using brass tacks in the construction of a chair is not only time consuming, but it is also a skill that takes a professional to get it just right. Luckily, we have just the right people to do this job. Hammering in several hundred nails in a straight line is one thing--tacking on the teardrop pattern in the Regency Dining Chair is an entirely different ball game. It takes time, patience and experience. I think the end result speaks for itself. It really does reflect our philosophy and I believe that there is a lot of value in a chair with this combination of price and craftsmanship. 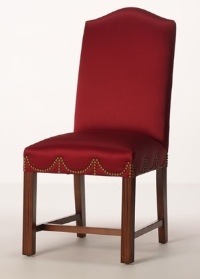 The Regency Dining Chair is one of my favorite styles and I think it will draw a lot of praise in your dining room.